Hopefully everyone had a great weekend! Here in the Northwest it was a hot weekend. I got to attend a food bloggers conference and met some great bloggers and, of course, tasted some delicious food! What did you do? It's the first day of June, which means there is only two weeks left of school, more summer days to come, and delicious red fruit is in season. You must have seen these sweet, juicy red fruit in your supermarket! Sadly cherries are just seasonal, so enjoy them while they last. Cherries are packed with antioxidants; they help reduce muscle pain and keep your heart healthy. This superfood can also help you sleep well. You can enjoy them just as they are, which makes a great snack, but you can also dress them up in quick chicken and cherry salad like this one. But cherries are not the only ingredient with delicious benefits. Olive oil is good for gallbladder health. It increases the production of pancreatic juices and the risk of gallstones decreases. Don't forget the greens that make this salad a recipe: spinach. Spinach promotes healthy, glowing skin. It is low in calories but very high in nutrients and helps the brain and nervous system function. Sprinkle salt and pepper to chicken. Whisk 3 Tablespoons oil, 1 teaspoon honey, 1/2 Tablespoon balsamic vinegar, and 1 Tablespoon dijon mustard. Add chicken and marinade for 10 minutes. Sear chicken both sides until cooked through; 10 minutes. 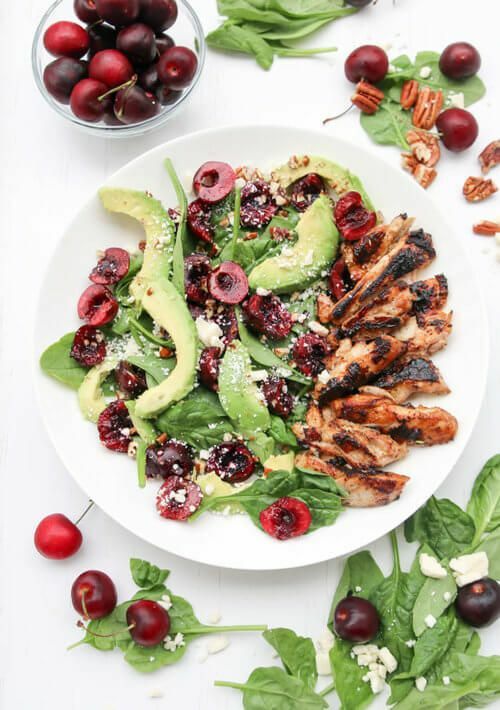 On a plate arrange 1/2 cup spinach, 1 cup pitted and sliced cherries, 1 Tablespoon feta cheese, 1/2 sliced avocado, and 1 Tablespoon chopped pecans. Slice and add chicken to the salad ingredients.